LONDON: Iranian police arrested 100 protesters in the capital on Monday, the deputy governor of Tehran said, as a police crackdown intensified against anti-government demonstrations that began last week, reported Reuters. Security forces have struggled to contain protests that broke out last Thursday and have continued nationwide in the boldest challenge in years to the country’s clerical leadership. The unrest is the worst since crowds took to the streets in 2009 to condemn the re-election of then-president Mahmoud Ahmadinejad. One member of the security forces was reported killed on Monday. 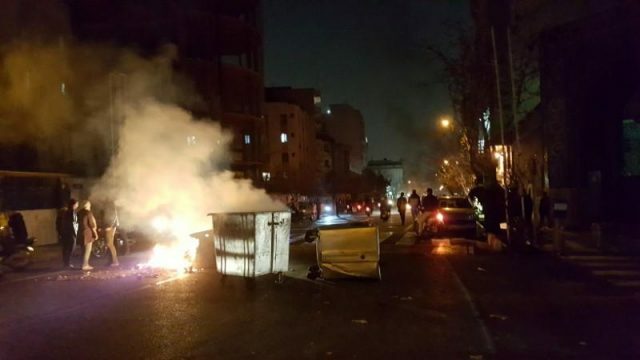 “200 people were arrested on Saturday, 150 people on Sunday and around 100 people on Monday,” Ali Asghar Naserbakht, deputy governor of Tehran province, was quoted as saying by semi-official ILNA news agency on Tuesday. He said the situation in Tehran was under control and the police has not asked for the help of the Revolutionary Guards special forces.